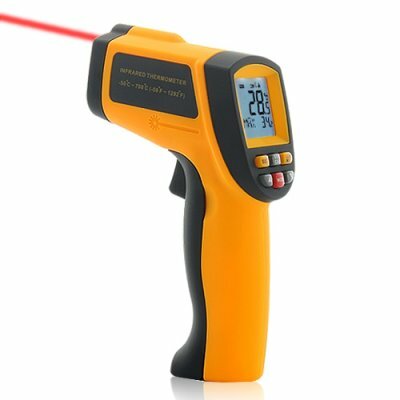 Successfully Added Advanced Non-Contact Infrared Thermometer - Laser Targeting and Emissivity Adjustment to your Shopping Cart. Advanced Non-Contact Infrared Thermometer with Laser Targeting/Emissivity Adjustment: with new added features and functions, this handy tool gives you accurate surface temperature readings in less than a second. This product is perfect for anyone needing to detect cold or heat leak in the house, look for the overheating electronic component in a product, or even preparing the baby’s milk to the right temperature. With its long range, accurate measurement, and immediate response, it can be used in a wide range of applications. Using this non-contact thermometer is easy and safe too. Just aim and pull the trigger, the temperature will instantly show up on the LCD display. The laser sighting helps you aim at targets both near and far away. The product even comes with a LCD backlight for you to easily read the temperature in the dark. Now with new added emissivity adjustment feature, you can change the emissivity level according to the material that’s being measured for even more accurate reading. 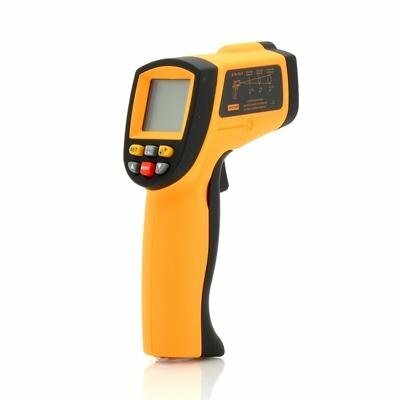 Compared with other similar products on the market, this infrared thermometer comes with more sophisticated functions including computing difference between temperature readings, high and low temperature alarm, data storage, measuring average temperature, etc. This device starts paying for itself immediately by saving you time, money, and worry. Its wide range of application makes it a must-have item for electricians, mechanics, building inspectors, maintenance men, and DIY handymen. Buy one for yourself today, or order in bulk to sell and profit. Available from your best source for wholesale electronics, Chinavasion. This product is not intended to be used as a medical device especially as it uses a laser which can damage eyes. Chinavasion be held responsible for any misuse. Very fast delivery (within 5 days) by DHL, perfect device, for a real good price. Good shipment and packaging. The only thing you have to add its how to calibrate very well the emmisity of the skin in cold temperatures because the readings are not convincing.